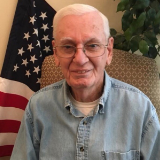 Dwayne Barton, 80, of St. Joseph, MO formerly of Gower, MO passed away, March 28, 2019. He was born on June 2, 1938 to Thomas Singleton and Jessie (Donaldson) Barton near Frazier, MO. Dwayne grew up near Gower and graduated from Gower High School. Dwayne was a grain inspector for the Missouri Department of Agriculture for over 40 years. He loved living in the country and the family farm, and most of all enjoyed spending time with his family. He was preceded in death by his parents, brothers, Thomas, Joe, Fred and Floyd Barton; sisters, Mary Holt, Evelyn Mayer, Iona Roberts, Geraldine Dobson, and Gertrude Jackson. Dwayne is survived by his children, Dwayne Barton, Jr., Kimberly Wisdom, and Kristina (Eric) Farley; grandchildren, Claire Barton, Meryl (Taylor) Homoky, Kelsey (Larry) Williams, Madeline McCampbell, Dustin Wisdom, Sofia Farley; great-grandson, Boston; brother, Kenny (Mary) Barton; sister, Colleen (Charlie) Gott; several nieces and nephews, other relatives and many friends. Visitation: 6:00-8:00 p.m. Tuesday, April 2, 2019 at Hixson-Klein Funeral Home, Gower. In lieu of flowers, donations may be made to IPF Foundation. www.ipffoundation.org.